Open-pit mining, open-cut mining or opencast mining is a surface mining technique of extracting rock or minerals from the earth by their removal from an open pit or borrow. The result of using this technique is a huge visible scar on the earth surface. Here is a list of 10 incredible such open-pit mines. Mirny Mine is an inactive diamond mine in Mirny, Eastern Siberia. It is the largest open diamond mine in the world and the second largest excavated hole in the world. It is 525 meters (1,722 ft) deep and has a diameter of 1,200 m (3,900 ft). The airspace above the mine is closed for helicopters because of incidents in which they were sucked in by the downward air flow! The Bingham Canyon Mine, also known as the Kennecott Copper Mine, is an open-pit mine located in the southwest of Salt Lake City, Utah. It is the largest and deepest excavated hole in the world: it is 0.6 miles (0.97 km) deep, 2.5 miles (4 km) wide! It was designated a National Historic Landmark in 1966. Australia’s largest open cut gold mine. The pit is oblong in shape and is approximately 3.5 kilometers long, 1.5 kilometers wide and 570 meters deep. At these dimensions, it is large enough to be seen from space. 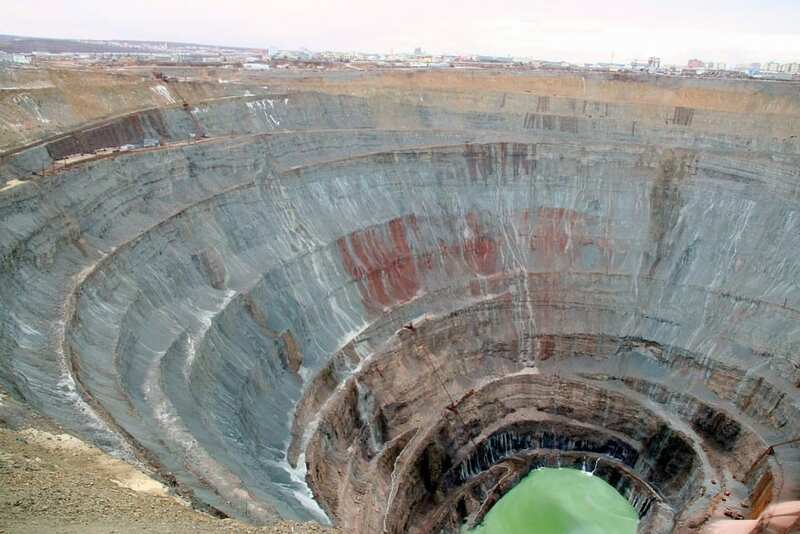 An open-pit and underground mine in Kimberley, South Africa, and claimed to be the largest hole excavated by hand. It was open in 1871 and closed in 1914. its 43-year lifetime, the 50,000 workers who used picks and shovels shifted 22.5 million tonnes of earth, yielding almost 3 tonnes of diamonds. It is 463 meters (1,519 ft) wide and was excavated to a depth of 240 meters (790 ft), but then partially infilled with debris reducing its depth to about 215 meters (705 ft). Since then it has accumulated about 40 meters (130 ft) of water, leaving 175 meters (574 ft) of the hole visible. An active diamond mine that has become an important part of the regional economy, employing 700 and producing 1,500 kg (3,300 lb) of diamonds a year. Located on a small 20 square km island, it is just 220 km (140 mi) from the Arctic Circle and during the winter the water around it freezes over. Canada’s first surface and underground diamond mine. It is located 310 km (190 mi) north-east of Yellowknife, Northwest Territories, and about 200 km (120 mi) south of the Arctic circle. The world’s biggest gold mine and third largest copper mine. Opened in 1973, it now employs 19,500 workers. The biggest open pit copper mine in the world, by excavated volume. Its depth of 850 meters (2,790 ft) makes it the second deepest open-pit mine in the world. The Udachnaya mine is one of the largest diamond mines in Russia and in the world. The mine is located in the north-eastern part of the country in the Sakha Republic. The mine has estimated reserves of 225.8 million carats of diamonds and an annual production capacity of 10.4 million carats. Escondida is a copper mine in the Atacama Desert in Antofagasta Region, Chile. It actually consists of two open-pit mines. Construction began in 1990, and it now yields over 1 million tonnes of copper a year (and a record of 1.48 tons in 2007).